Our grooming salon also provides Do-It-Yourself baths. Bathe your dog at Cory’s Klips without having to worry about the mess at home or leaving your pup with a stranger. Also, you can feel safe knowing your working with professional equipment and supplies when you bring in your dog for a do-it-yourself cleaning. 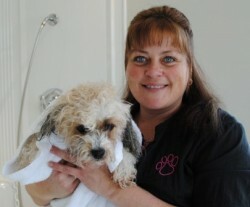 We offer specials on our do-it-yourself baths; bring in your dog for five baths get the sixth one free! Call us today at 250-586-0076. Or drop by for a visit!